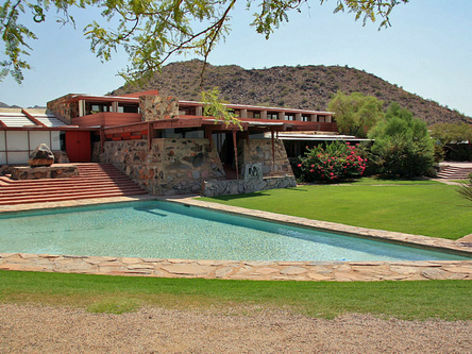 In 1937 Wright brought 600 acres in the Sonoran Desert at the foot of McDowell Mountain. He built there first a camp and then gradually an entire complex of offices, drafting rooms, and living quarters. All the while, Taliesin West served as a laboratory for Wright’s ideas and was constructed almost entirely by the architecture students who studied there. The walls are concrete poured around large desert stones. Any of Wright’s work is about space and transition and going from inside to outside and back inside again, and seeing and experiencing it is a great part of understanding the architecture. 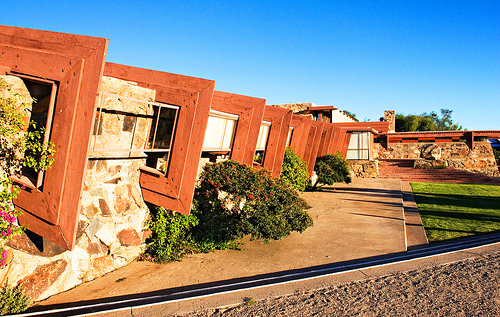 It’s a style that grows very, very much out of the place and so that Taliesin West wouldn’t make sense in any other location. That it is of the place. Using the materials and keeping in mind the unique nature of that particular location and site. Wright was really striving to respond to the local climate and conditions and at the same time using that in his quest for defining what he considered a new American architecture and also doing it with a certain amount of regionalism in terms of the design. I would say that it’s probably the most well grounded facility in all of America quite frankly. Its recognition of the terrain, its recognition of the materials. Its profile along the desert, its hugging of the desert, its low profile that speaks to the wind blowing over the top of it. It speaks to the shade that is required and is built out of the materials that were just absolutely dug right out of the ground.